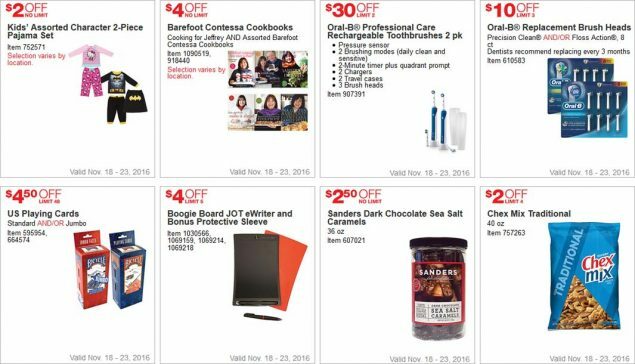 We’ve just posted the Costco Black Friday 2016 Week 2 coupons and prices. They will run from November 18th through the 28th. 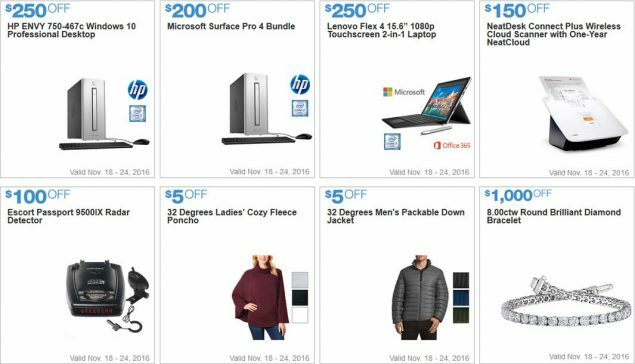 In order to see the coupons you need to follow the link above, which will take you directly to them. 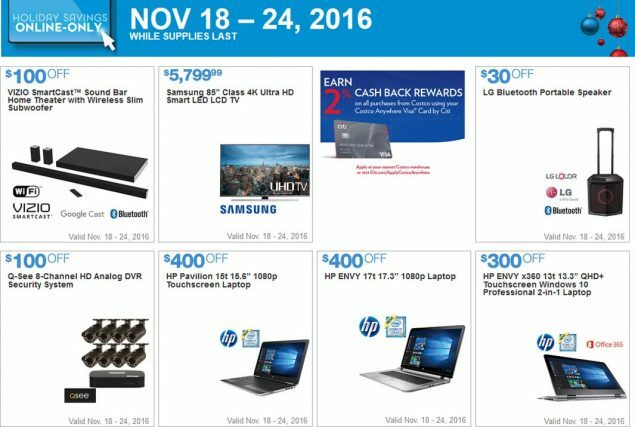 Also of note, there are also some deals that will run only through the 23rd and some online ones that run through the 24th. We’ve also posted the Week 1 Costco Black Friday 2016 coupons if you’d like to see those. 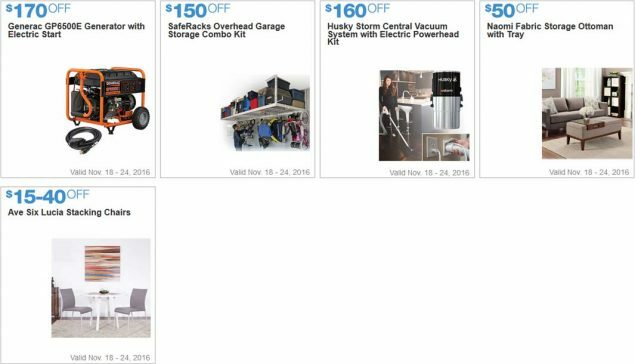 The Black Friday weekend only coupons will run from November 25th through the 28th and also are available for viewing. 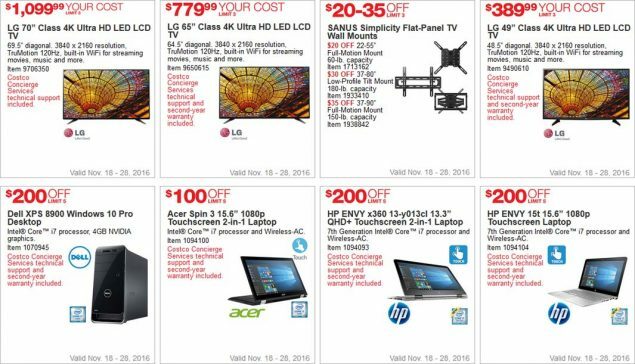 The second week of Costco Black Friday 2016 coupons features a lot of deals. The first couple of pages are all TV’s, and there a quite a few good deals throughout. 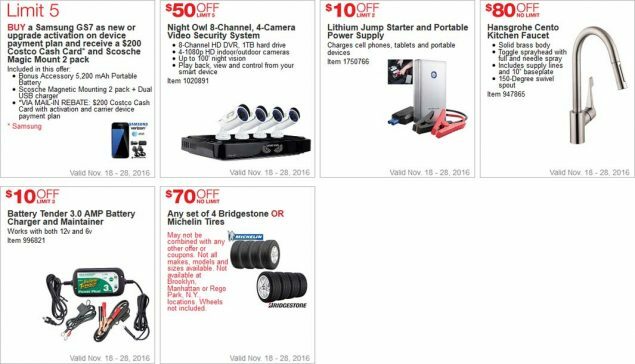 The tire coupon is good for both Bridgestone and Michelin, which only happens once a year. If you’ve never tried the Sanders Dark Chocolate Sea Salt Caramels they’re quite amazing and at $6.49 after coupon they’re a great price. Which items on sale are you most intrigued by? 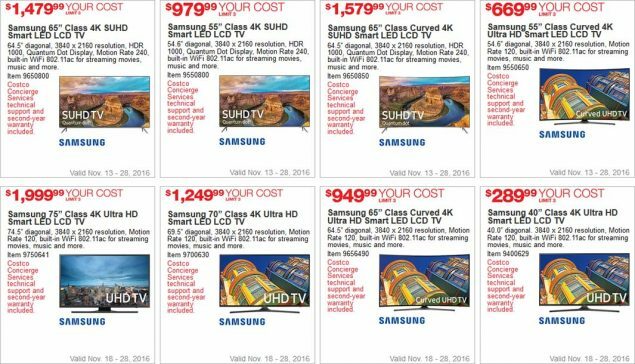 Any of the TVs stand out to you as a great deal? 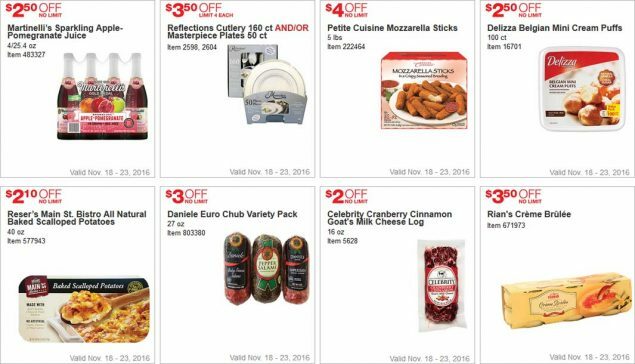 Remember, you have to click the link at the top of the post page to see the coupons and their original prices. VIZIO 70″ Class 4K Ultra HD LED LCD Home Theater Display 69.5″ diagonal, tuner-free display, 3840 x 2160 resolution, 120Hz Effective Refresh Rate, WiFi and Chromecast built in. VIZIO 65″ Class 4K Ultra HD LED LCD Home Theater Display 64.5″ diagonal. tuner-free display, 3840 x 2160 resolution, 120Hz Effective Refresh Rate, WiFi and Chromecast built in. $689.99 YOUR COST LIMIT 3. Item 9650017. VIZIO 60″ Class 4K Ultra HD LED LCD Home Theater Display with Dolby Vision High Dynamic Range 59.5″ diagonal, tuner-free display, 3840 x 2160 resolution, 240Hz Effective Refresh Rate, WiFi and Chromecast built in. 6″ tablet remote included. $749.99 YOUR COST LIMIT 3. Item 9600001. VIZIO 55″ Class 4K Ultra HD LED LCD Home Theater Display 54.6″ diagonal, tuner-free display, 3840 x 2160 resolution, 120Hz Effective Refresh Rate, WiFi and Chromecast built in. $459.99 YOUR COST LIMIT 3. Item 9550017. VIZIO 50″ Class 4K Ultra HD LED LCD Home Theater Display 49.5″ diagonal, tuner-free display, 3840 x 2160 resolution, 120Hz Effective Refresh Rate, WiFi and Chromecast built in. $389.99 YOUR COST LIMIT 3. Item 9500017. VIZIO 70″ Class 4K Ultra HD LED LCD Home Theater Display with Dolby Vision High Dynamic Range 69.5″ diagonal, tuner-free display, 3840 x 2160 resolution, 240Hz Effective Refresh Rate, WiFi and Chromecast built in. 6″ tablet remote included. $1,649.99 YOUR COST LIMIT 3. Item 7444370. VIZIO 65″ Class 4K Ultra HD LED LCD Home Theater Display with Dolby Vision High Dynamic Range 64.5″ diagonal, tuner-free display, 3840 x 2160 resolution, 240Hz Effective Refresh Rate, WiFi and Chromecast built in. 6″ tablet remote included. $999.99 YOUR COST LIMIT 3. Item 9650001. $100 OFF LIMIT 5. Item 1114051. Samsung 65″ Class 4K SUHD Smart LED LCD TV 64.5″ diagonal, 3840 x 2160 resolution, HDR 1000, Quantum Dot Display, Motion Rate 240, built-in WiFi 802.11ac for streaming movies, music and more. $1,479.99 YOUR COST LIMIT 3. Item 9650800. Samsung 55″ Class 4K SUHD Smart LED LCD TV 54.6″ diagonal, 3840 x 2160 resolution, HDR 1000, Quantum Dot Display, Motion Rate 240, built-in WiFi 802.11ac for streaming movies, music and more. $979.99 YOUR COST LIMIT 3. Item 9550800. Samsung 65″ Class Curved 4K SUHD Smart LED LCD TV 64.5″ diagonal, 3840 x 2160 resolution, HDR 1000, Quantum Dot Display, Motion Rate 240, built-in WiFi 802.11ac for streaming movies, music and more. $1,579.99 YOUR COST LIMIT 3. Item 9650850. Samsung 55″ Class Curved 4K Ultra HD Smart LED LCD TV 54.6″ diagonal, 3840 x 2160 resolution, Motion Rate 120, built-in WiFi 802.11ac for streaming movies, music and more. $669.99 YOUR COST LIMIT 3. Item 9550650. Samsung 75″ Class 4K Ultra HD Smart LED LCD TV 74.5″ diagonal, 3840 x 2160 resolution, Motion Rate 120, built-in WiFi 802.11ac for streaming movies, music and more. $1,999.99 YOUR COST LIMIT 3. Item 9750641. Samsung 70″ Class 4K Ultra HD Smart LED LCD TV 69.5″ diagonal, 3840 x 2160 resolution, Motion Rate 120, built-in WiFi 802.11ac for streaming movies, music and more. $1,249.99 YOUR COST LIMIT 3. Item 9700630. Samsung 65″ Class Curved 4K Ultra HD Smart LED LCD TV 64.5″ diagonal, 3840 x 2160 resolution, Motion Rate 120, built-in WiFi 802.11ac for streaming movies, music and more. $949.99 YOUR COST LIMIT 3.Item 9656490. Samsung 40″ Class 4K Ultra HD Smart LED LCD TV 40.0″ diagonal. 3840 x 2160 resolution, Motion Rate 120, built-in WiFi 802.11ac for streaming movies, music and more. $289.99 YOUR COST LIMIT 3.Item 9400629. Samsung 60″ Class 4K Ultra HD Smart LED LCD TV 60″ diagonal, 3840 x 2160 resolution, Motion Rate 120, built-in WiFi 802.11ac for streaming movies, music and more. $679.99 YOUR COST LIMIT 3. Item 9600630. Samsung 55″ Class 4K Ultra HD Smart LED LCD TV 54.6″ diagonal, 3840 x 2160 resolution, Motion Rate 120, built-in WiFi 802.11ac for streaming movies, music and more. $549.99 YOUR COST LIMIT 3. Item 9550630. 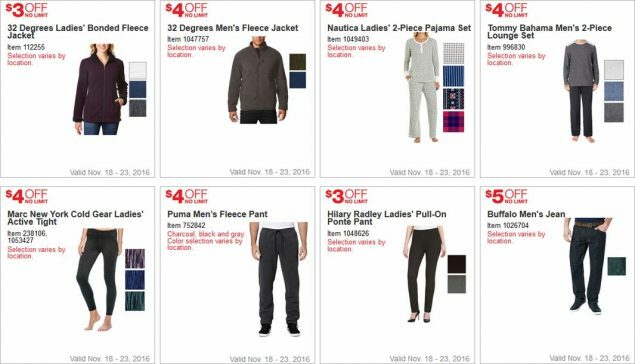 $35 OFF LIMIT 3. Item 999057. $239.99 YOUR COST LIMIT 3. Item 9400520. Samsung Sound Bar with Wireless Subwoofer HW-KM45C $139.99 2.1 Channels, 300 Watts, Bluetooth compatibility to stream music wirelessly from your mobile device, HDMI and optical cables included. $110 OFF LIMIT 3. Item 1070045. Samsung 4K Ultra HD Blu-ray Player UBD-KM85c True 4K UHD playback with HDR compatibility, UHD upscaler, also plays 3D and standard Blu-ray discs, built-in WiFi, HDMI cable included. $110 OFF LIMIT 3. Item 1118585. 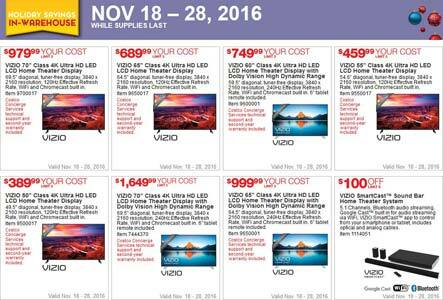 Valid Nov. 18 – 28, 2016. 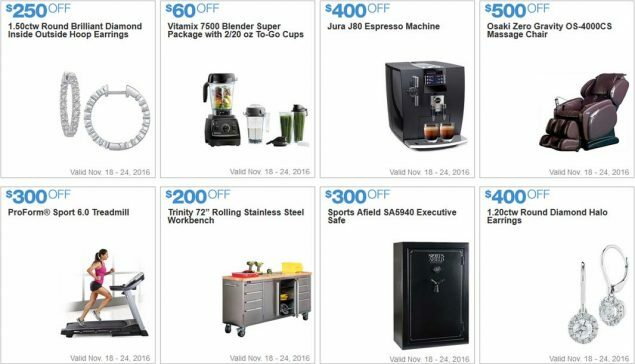 $100 OFF LIMIT 3. Item 1080061. $70 OFF LIMIT 3. Item 481405. LG 70″ Class 4K Ultra HD LED LCD TV 69.5″ diagonal. 3840 x 2160 resolution, TruMotion 120Hz, built-in WiFi for streaming movies, music and more. $1,099.99 YOUR COST LIMIT 3. Item 9706350. LG 65″ Class 4K Ultra HD LED LCD TV 64.5″ diagonal. 3840 x 2160 resolution, TruMotion 120Hz, built-in WiFi for streaming movies, music and more. $779.99 YOUR COST LIMIT 3. Item 9650615. LG 49″ Class 4K Ultra HD LED LCD TV 48.5″ diagonal. 3840 x 2160 resolution, TruMotion 120Hz, built-in WiFi for streaming movies, music and more. $389.99 OFF LIMIT 3. Item 9490610. Dell XPS 8900 Windows 10 Pro Desktop Intel® Core™ i7 processor, 4GB NVIDIA graphics. $200 OFF LIMIT 5. Item 1070945. Acer Spin 3 15.6″ 1080p Touchscreen 2-in-1 Laptop Intel® Core™ i7 processor and Wireless-AC. $100 OFF LIMIT 5. Item 1094100. $200 OFF LIMIT 5. Item 1094093. $200 OFF LIMIT 5. Item 1094104. $5 OFF LIMIT 3. Item 121. Plantronics BackBeat Fit Bluetooth Sport Headphones Sweatproof, around-the-neck style, wireless sport headphones, 8-hour built-in battery, mic for taking calls, neoprene armband for smartphone reverses to store headphones. $20 OFF LIMIT 2. Item 1040444. $50 OFF LIMIT 3. Item 998770. $8 OFF LIMIT 3. Item 1095467. $50 OFF LIMIT 5. Item 725197. ION Flash Tailgater Bluetooth Portable Speaker Portable speaker with Bluetooth compatibility to wirelessly stream music from your smartphone or tablet. Features LED color-changing light panel on the speaker grill, built-in rechargeable battery microphone included. $20 OFF LIMIT 3. Item 1111888. $10 OFF LIMIT 5. Item 1070457. 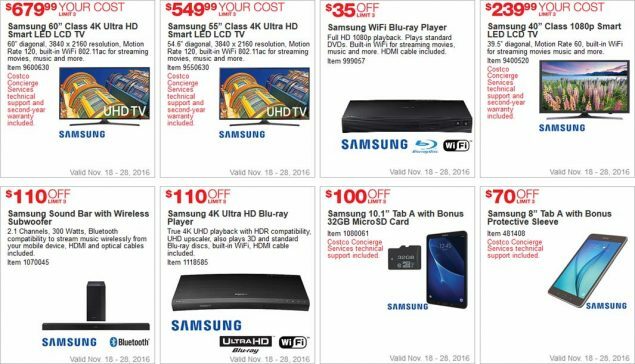 *VIA MAIL-IN REBATE: $200 Costco Cash Card with activation and carrier device payment plan Limit 5. $50 OFF LIMIT 5. Item 1020891. $10 OFF LIMIT 2.Item 1750766. 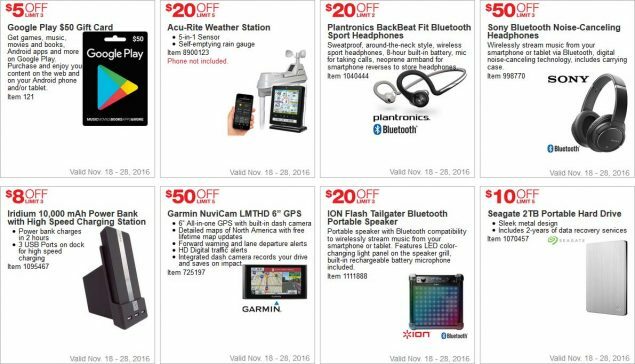 $80 OFF NO LIMIT. Item 947865. $10 OFF LIMIT 3. Item 996821. $25 OFF LIMIT 5. Item 1881975. $6 OFF LIMIT 5. Item 1984865. $3 OFF LIMIT 5. Item 161371. 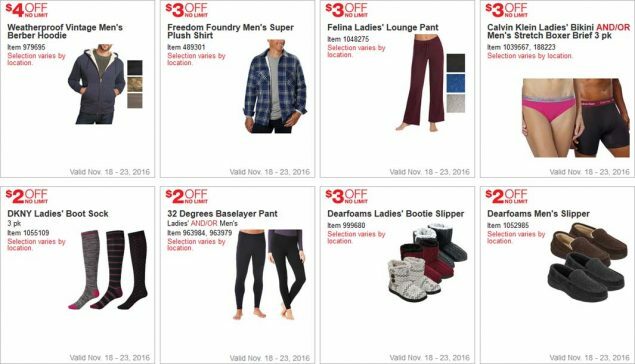 $30 OFF LIMIT 5. Item 1060691. $20 OFF LIMIT 5. Item 823562. $25 OFF LIMIT 5. Item 941114. $2 OFF LIMIT 10. Item 607323. $15 OFF LIMIT 5. Item 577764, 577765, 577766. $3 OFF NO LIMIT. Item 112255. $4 OFF NO LIMIT. Item 1047757. $4 OFF NO LIMIT. Item 1049403. 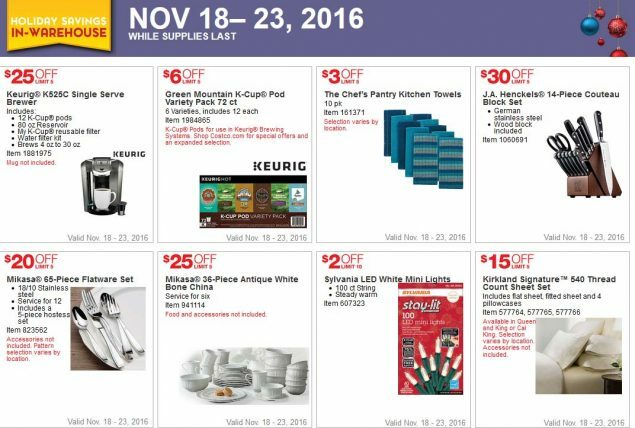 Valid Nov. 18 – 23, 2016. $4 OFF NO LIMIT. Item 996830. $4 OFF NO LIMIT. Item 238106, 1053427. $4 OFF NO LIMIT. Item 752842. $3 OFF NO LIMIT. Item 1048626. $5 OFF NO LIMIT. Item 1026704. $4 OFF NO LIMIT. Item 979695. $3 OFF NO LIMIT. Item 489301. $3 OFF NO LIMIT. Item 1048275. $3 OFF NO LIMIT. Item 1039567, 188223. $2 OFF NO LIMIT. Item 1055109. $2 OFF NO LIMIT. Item 963984, 963979. $3 OFF NO LIMIT. Item 999680. $2 OFF NO LIMIT. Item 1052985. $2 OFF NO LIMIT. Item 752571. $4 OFF NO LIMIT Item 1090519, 918440. $30 OFF LIMIT 2. Item 907391. $10 OFF LIMIT 3. Item 610583. ONLY $4.50 OFF LIMIT 48. Item 595954, 664574. $4 OFF LIMIT 5. . Item 1030566, 1069159, 1069214, 1069218. $2.50 OFF NO LIMIT. Item 607021. $2 OFF LIMIT 4. Item 757263. $2.50 OFF NO LIMIT. Item 483327. $3.50 OFF LIMIT 4 EACH. Item 2598, 2604. $2.50 OFF NO LIMIT. Item 16701. $2.10 OFF NO LIMIT. Item 577943. $2 OFF NO LIMIT. Item 5628. VIZIO SmartCast™ Sound Bar SB4551-D5 Home Theater with Wireless Slim Subwoofer 5.1 Channels, 45″ bar, slim subwoofer and rear satellites, Bluetooth audio streaming, Google Cast™ built-in for audio streaming via WiFi, VIZIO SmartCast™ app to control from a smartphone or tablet, includes optical and analog cables. Samsung 85″ Class 4K Ultra HD Smart LED LCD TV. 84.5″ diagonal, 3840 x 2160 resolution, Motion Rate 240, built-in Wi-Fi 802.11ac for streaming movies, music and more. $5,799.99 YOUR COST. Item 9850645. LG Bluetooth Portable Speaker Portable speaker with Bluetooth compatibility to wirelessly stream music from your smartphone or tablet. Features telescoping handle and wheels for easy portability, built-in battery, USB charging, USB playback, and FM radio. Q-See 8-Channel HD Analog DVR Security System. Includes 8 outdoor-rated HD 1080p bullet cameras, 8-channel 2TB recorder and 8/60′ cables. Remote viewing available via free app. HP Pavilion 15t 15.6″ 1080p Touchscreen Laptop. 7th Generation Intel® Core™ i7 processor, Wireless-AC and backlit keyboard. Item 1100934. Costco Concierge Services technical support and second-year warranty included. HP ENVY 17t 17.3″ 1080p Laptop 7th Generation Intel® Core™ i7 processor, 4GB NVIDIA graphics, Wireless-AC and backlit keyboard. HP ENVY x360 13t 13.3″ QHD+ Touchscreen Windows 10 Professional 2-in-1 Laptop 7th Generation Intel® Core™ i7 processor and Office 365 Personal (1-year subscription). HP ENVY 750-467c Windows 10 Professional Desktop Intel® Core™ i7 processor, 4GB NVIDIA Graphics and Wireless-AC. Microsoft Surface Pro 4 Bundle ntel® Core™ i7 processor, Surface Pen, Surface Pro Type Cover, Microsoft Office 365 Personal (1-year subscription) and Windows 10 Professional. Lenovo Flex 4 15.6″ 1080p Touchscreen 2-in-1 Laptop 7th Generation Intel® Core™ i7 processor, Wireless-AC and backlit keyboard. 8.00ctw Round Brilliant Diamond Bracelet VS2 Clarity, I Color, 14 kt White Gold. 1.50ctw Round Brilliant Diamond Inside Outside Hoop Earrings VS2 Clarity, I Color, 14 kt White Gold. Vitamix 7500 Blender Super Package with 2/20 oz To-Go Cups 7500 Machine, 64 oz low-profile container, 32 oz dry grains container, 2/20 oz to-go cups, “Simply Fresh” cookbook, getting started guide, “Whole Grains” cookbook, getting started DVD and tamper. 7-year warranty. $500 OFF. O Item 1069708, 1069712, 1069713. 1.20ctw Round Diamond Halo Earrings VS2 Clarity, I Color, 14 kt White Gold. $15-40 OFF. Ave Six Lucia Stacking Chairs. Item 1099684, 1099715.